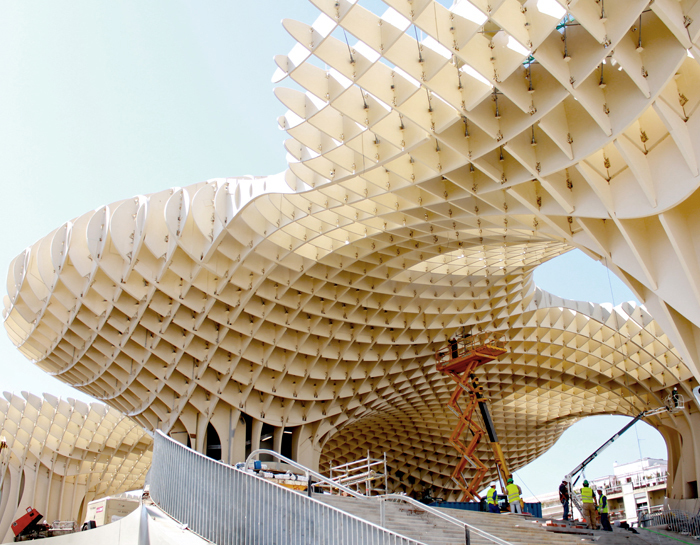 The Metropol Parasol in Seville, Spain, by Jurgen Mayer H. Architects, is the world's largest wooden structure. We've been following this amazing design since its planning phase, and now the fantastic project is finally complete! Located at Plaza de la Encarnacion, the beautiful series of undulating parasols comprise the world's largest wooden structure. Metropol’s interlocking honeycomb of wooden panels rise from concrete bases, which are positioned to form canopies and walkways below the parasols. Jurgen Mayer H. Architects goal with Metropol Parasol’s neutral tone was to help harmonize the stark contrast of the ultra-modern structure with the medieval surroundings of Seville. Stairways and storefronts sit below the wooden parasols, which form the largest wooden structure in the world. The innovative structure is made from bonded timber with a polyurethane coating. The actual site was originally slated to become a parking garage, but after excavations revealed archeological findings, the city of Seville decided to make the site a museum and community center. Metropol Parasol now houses said museum, a farmers market, an elevated plaza, and a restaurant, most of which are open-air. The elevated rooftop promenades located on top of the parasols, offer visitors amazing views of the city. Seville is a city with rich history and a unique medieval inner city. Metropol Parasol defines Seville’s iconic cultural role, meshing a historic archeological destination with a sleek contemporary landmark. We were very fortunate to spend some time in Sevilla in 2013 and seeing the "Waffle" was one the highlights. A very unique and beautiful piece of design and engineering. Visited the Metropol this week with my wife. We were unable to visit any part of it as it was all closed (on a Saturday) which was disappointing. The area underneath looked a little bleak and not well-maintained, belying its 'newness' I thought it to be a very interesting and thoughtful structure in a 'Gaudiesque' kind of way, my wife thought that it was 'a blot on the landscape' though she enjoyed the thriving food market underneath ! I visited the Parasol structure and underground museum in late May of 2011. Granted many of the museum displays were as yet incomplete but it was open to the public despite even the mass of protesters (an incident not isolated in Seville nor associated with the Parasol.) I won't debate the politics as it is inevitable there will always be those who like and those who dislike...anything...period! The debate will rage on everywhere about how best to spend local monies to promote tourism. As a visitor, this is how I see it as something most locals will disregard but as something tourists will come and visit. IT GENERATES REVENUE both for the museum and for the city. As an Architect, I rather enjoyed being able to walk atop the Parasol and see the city from a different/ higher vantage point. Perhaps because I live in a mountainous region in the U.S.A., but I think it is true of a lot of people throughout the world. It was also a magnificent structure to photograph with regard to light, shade, and shadow. Not all of us are "typical privileged Americans who grew up in wealthy families..." as dr.floyd suggests. I agree with ahinalu and while I'm at it, both the base and lattice appear to be made of steel reinforced concrete, not wood. My limited knowledge of the structural properties of wood would lead me to believe the same light airy design would be nearly, if not entirely, impossible with said material. Furthermore; Lorraine, what makes you think "Africa" needs help? It is a big continent and from my experience, nearly every country in Africa suffers the same socioeconomic problems as every other country in the world. We can't solve their problems by just giving them money/ housing. Doing so only exacerbates their problems. There are enough wealthy people in those countries that will not give to their own people...why should we? They were doing fine enough until "white man" moved in and messed everything up! This is a work of genius. As another commentator noted not every gets Gaudi. How could they? This masterpiece is mind blowing. The people of Seville are lucky to have such a piece of artwork smack dab in their city. Bravo! Peter Justice is misinformed about the project which is typical of privileged Americans who grew up in wealthy families with no artistic taste. As we say down south, light it up! 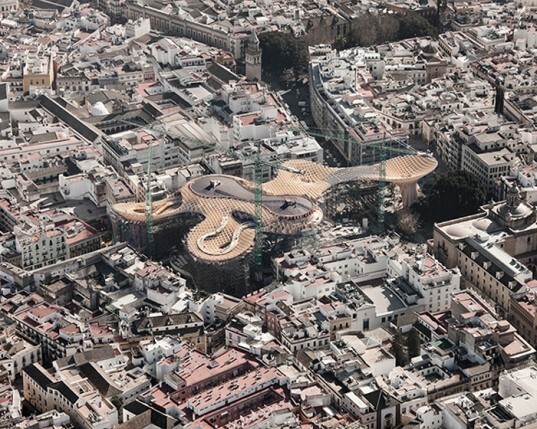 Like many architectural buildings in Spain over the past 100 years or so, there's controversy. Many people didn't and still don't like Gaudi's work, or the Guggenheim I'm sure people were complaining about all the construction all those centuries La Alhambra was being built. The beauty of art is the emotions it invokes, and when it's architecture, it brings out a lot of emotions since it's not sitting in a museum somewhere but it's in our faces. I think it's structures like this that keeps Spain from stagnating and keeps tourists dreaming of going there (or going back again). @peter justice: as the son of a Spaniard (mother was born in Bilbao, my family is from Burgos and Bermeo)...I sure hope you're not American because if you are calling Spaniards lazy would be like a slug calling a horse slow. Achtungdani and Lorraine J have said it all ... nothing to add. Sorry folks but I dont like it. Dear Andvaranaut, I admit I can be wrong, but a friend of mine, also an architect, has worked calculating the steel structure that supports the wood "packaging", that´s how I know that the structure is not made of wood. She told me that the first idea was to build the structure out of wood, but they realized it wasn´t possible, so they changed to steel. Concerning the lease of the complex by Sacyr, this is not accurate. The Town Hall had a building in the square. It has given it to Sacyr, as part of the wage. The Town Hall, before the crisis, planned to build another building in another place, but now they have no money, so they will remain in this building, paying Sacyr a lease that will cost much money every month to all of us, so I doubt the deal is so positive for the people of Seville. Another thing: the structure is indeed very optimized, it took a few teams of engineers quite a bit of time to come up with the final distribution of wood pieces... Each 'pixel' is about 1.5m side, and the width of the wood pieces varies, but is about 10-15 cm. So the vast majority of the space the structure occupies is open air instead of wood. The 'waffle' won't be that good a shelter against rain, of course, but I can vouch for it being stellar against sunrays! With regards to the ecological values of the wood, it has been provided by Finnforest (Kerto-Q) and, if I'm not mistaken, it is grown in certified forests, so I suppose it does qualify as "non-evil". For completeness, however, it must be noted that the structural unions use a special kind of glue (and plain old nuts&bolts), and the wood is dipped in polyurethane - I'm not sure how "green" these processes are. (I actually had this answer written weeks ago, but the authentication system here ate it and I was too lazy to retype ;) In fact it has just done it again... but I have been smart enough to copy it to the clipboard this time - live and learn). And achtungdani's information is not really accurate. The concrete and steel part is just the support and the platform of the restaurant (easy to see in Google Maps right now: http://bit.ly/egF41L ). All the rest of the structure is made of wood, which not only covers the above structure, but also supports the overhead walkway. In the map I link to it's easy to make out the concrete "stumps" which support the other 4 parasols - every other thing is wood. In fact, massive scaffolding has been needed to support the structure until the wooden 'puzzle' was complete and the structure became self-supporting. The scale & place considerations are a matter of taste. I love it there, and it will provide a much needed attraction point to a part of the historical centre which is routinely neglected by tourists. But hey, to each his own. With regards to money, it has been costly indeed (about 90 M€, of which 20 M€ has been paid by Sacyr in exchange for a 40-year lease of the complex) but I'm sure that the returns will soon make the cost seem not that exorbitant. Cheers! Lorraine jenks asks the first intelligent question in this discussion: The shape is nice, and the public place it creates definitely is not something one encounters often. But I'm sceptical about the mass optimisation of the wood structure in respect to the form. i mean, Jurgen Mayer is definitely not to be compared to Buckminster Fuller, but I see a lot of wood ( a material that is not often as eco friendly as one would think)for little shelter. How eco friendly is this structure? Where was the wood sourced and how toxic are the bonding agents? As my mates have already said the works are almost finished. In relation with "spanish lazyness" is just a kind of weird and no sense expression that doesn,t fit at all. I would really like to encourage you to come to Seville as soon as posible just to judge yourself this new Seville architectonic atraction. I think it´s worth visiting next summer!!! For PeterJustice: you say that the project will need two more years to be finished, due to budget constraints and "spanish lazyness". That is completely false, it is almost finished and only some finals details remain (in at most one month it will be finished). Everything is already open to the public. Here the only lazyness seems to be in your brain. Hi all, PeterJustice does not appear to be really informed. If you visit right now Seville you can fully enjoy the two first overground levels. It is right that the Underground Museum and the SkyWalk over "umbrellas" are still in work, but just for several weeks, not for two years!! Metropol Parasol's neutral tone helps to harmonize the stark contrast of the ultra- modern structure with the medieval surroundings of Seville. Stairways and storefronts sit below the wooden parasols, which form the largest wooden structure in the world. The innovative structure is made from bonded timber with a polyurethane coating. The actual site was originally slated to become a parking garage, but after excavations revealed archeological findings, the city of Seville decided to make the site a museum and community center. Metropol Parasol now houses said museum, a farmers market, an elevated plaza, and a restaurant, most of which are open-air.